What will happen when the next shooter arrives? My take on it is that failing to train students to defend themselves leaves them open to the kind of disaster that occurred at Virginia Tech and elsewhere. than those who wait passively until help arrives. For those unwilling to get carry permits, a course in self-defense is strongly suggested. You either become part of the solution or you become a victim. The Nanny State, where all authority and force reside in the government is not a viable solution. There should be self-defense training for all students if concealed carry is prohibited on campus. I have received several passionate responses on both sides of the concealed carry issue. I have followed numerous articles and found that both sides are prone to exaggeration and fail to link to authoritative sources. For every horror story about a defense gone horribly wrong, there are others like this series about mass killers meeting armed resistance. 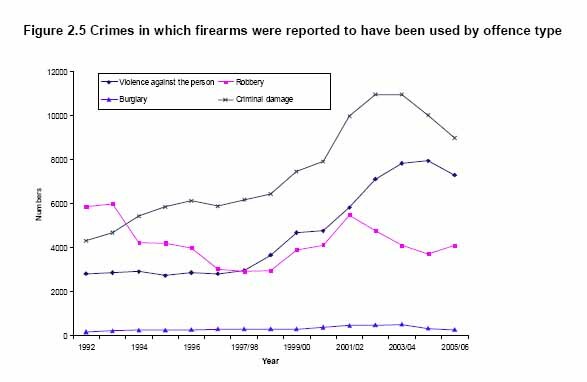 Between 1987 and 1990, David McDowall found that guns were used in defense during a crime incident an average of 64,615 times annually. 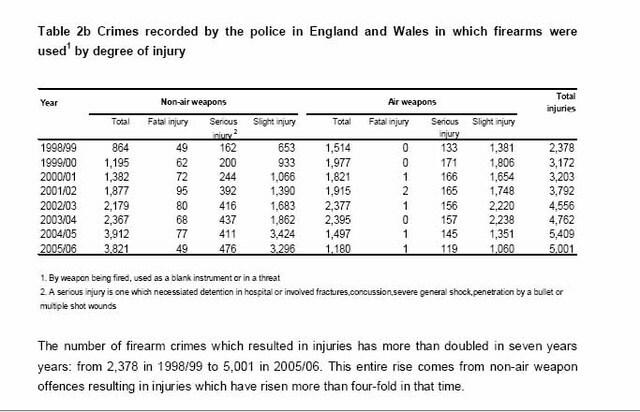 I look at that same data and say if those people had not been armed, there would have been more than 258,000 injuries or homicides. What I found is that anti-gun and pro-gun writers look at the same reports and draw vastly different conclusions. 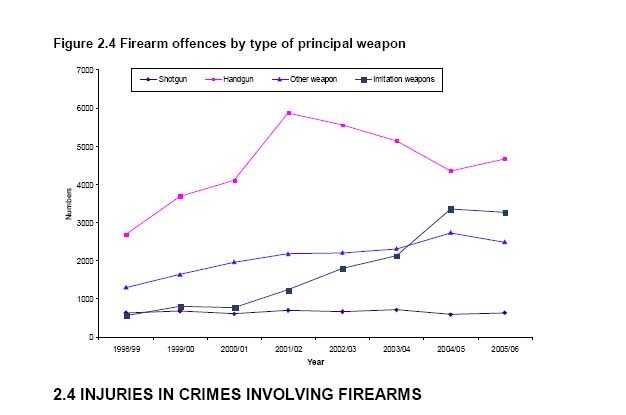 I have found some unimpeachable sources of information about gun violence trends in England where it has been illegal to own any kind of handgun for several years and homeowners are regularly imprisoned for repelling burglars with violence. 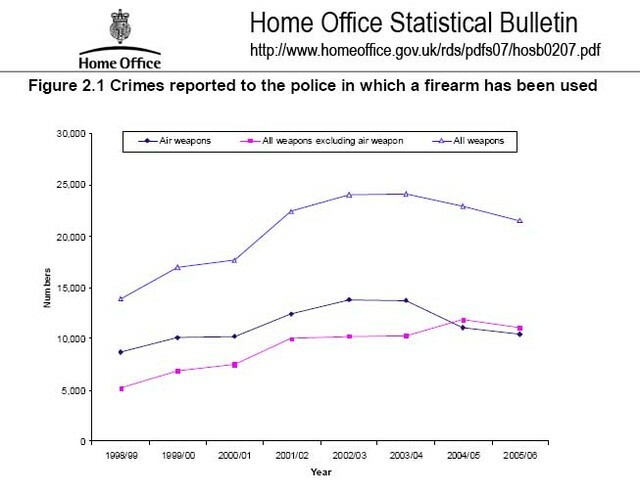 I would like you to review these graphs and decide for yourself whether complete gun control as it is practiced in England and Wales has reduced gun-related crimes. This entry was posted in News blogging and tagged armed resistance, gun control, gun violence, Home Office, mass killers, nanny state, Virginia Tech. Bookmark the permalink. 0 Responses to What will happen when the next shooter arrives? I think that this is only discussing half of the issue in terms of the VT shootings. The other half is mental health and how we address this as a society and culture. Generally speaking I’d rather that we raise the bar in this state in terms of purchasing firearms, particularly handguns, rather than make it so easy for one who is unstable to purchase a weapon and ammunition. Would this have changed anything? No one knows, but it seems like common sense to me to make it just a little more difficult than it is, perhaps. It is not an anti-gun statement but a fact to simply say that Virginia has some of the most relaxed gun purchasing laws in the nation. Finally I hope that our collective response is not a fundamentalist, finger pointing and blame response, but rather a compassionate one. I hope that people are a little more compassionate to their fellow humans in general because of something like this. Life is precious and short and it seems wise to me that we consider this in our thoughts following this event. Should we allow students to be armed? Personally I don’t think it such a wise idea given the development of a person at that time in life. An article to consider on this topic was in the Roanoke Times recently, written by Douglas K. Linder (see http://www.roanoke.com/editorials/commentary/wb/wb/xp-114367). 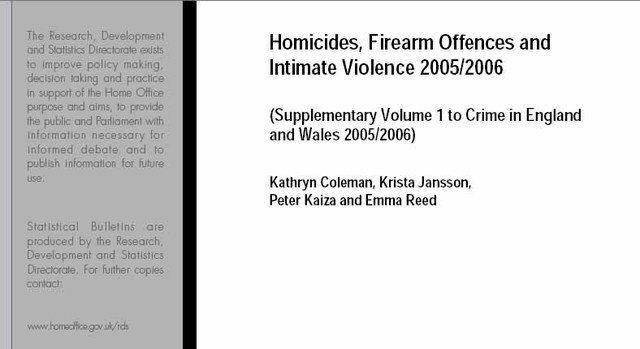 But this is a good discussion to undertake, especially if it can be done reasonably. If you think about it, this was their second chance. Morva was loose right next to campus nine months ago. The communications systems at VT failed then too, but no students were hurt, though three people were shot off campus. The University community had the opportunity to learn from that experience, and they chose not to. I’m sad to say that I doubt they’ll learn anything here either. I had not thought of saving lives as a political discussion. To me, it would be criminal to pretend that nothing should be done. If students are not prepared for this kind of situation through self defense training, we are doing them a great disservice. Very few people are temperamentally suited or trained well enough to carry weapons. Those who do not wish to become trained in weapons handling, should be given the chance to get trained in unarmed self defense. I do not feel that ignoring the problem is an appropriate response. Life in a post-corporate-life / country living environment means taking responsibility for our families and those around us.